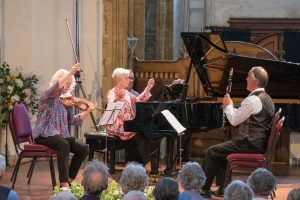 I’m just back from a week at the Gaudier Ensemble’s annual Cerne Abbas Music Festival in Dorset – my 25th year at the festival, I think. Some of the core players have been doing it for 28 years! But there are always new players and guest players, and this year we had the fabulous wind players Juliette Bausor, principal flute of the LPO, and Andrea de Flammineis, principal bassoon of the Royal Opera House, Covent Garden. As the years go by, and the original members have fanned out across Europe, it gets harder and harder to put everyone on the same spot for a week of music-making. But people have developed a fondness for the village, the villagers, and the annual reunion with the other players, and they try hard to make it work. It seems to me that many of the audience in Cerne Abbas have been faithfully coming to concerts for the whole lifespan of the festival. Over the years I have met many of them, and I value their ability to refer back to concerts of the past and who played in them. To my great relief the comments these days often revolve around the fact that the group’s main players not only haven’t changed much, but are playing better than ever. To me this seems true as well. We know one another pretty well, at least from the playing point of view, which is a great help when rehearsal time is short. Everyone knows they can rely on one another, even – or perhaps especially – in performance conditions. This year, rehearsal time was intense, because we played seven concerts over four days, not repeating a single item. We had to work very fast and economically. Keeping standards high can only be done if everyone is well prepared and has practised their part to concert standard, for there is no time to start from scratch. It’s as if everyone arrives with the juggling balls already in the air and immediately starts tossing the balls to one another. Each year it amazes me that such an amount of complex repertoire can be put together in such a short time, but of course it only works because the level of musicianship is so high. This entry was posted on Tuesday 31st July 2018 at 4:25pm	and is filed under Concerts, Musings, Travel. You can leave a response, or trackback from your own site.